Filled with history and culture, Marrakesh is a vibrant city of markets, mosques and palaces that defies its desert-like surroundings with its own individual color and vitality. One of the busiest cities in Africa, Marrakesh fully encourages and welcomes tourists from around the world and has seen plenty of hotel development over the past decade to keep up with the increasing tourism demand. Located inland, Marrakesh doesn’t have the coast to interest visitors, but it does have ample other attractions. 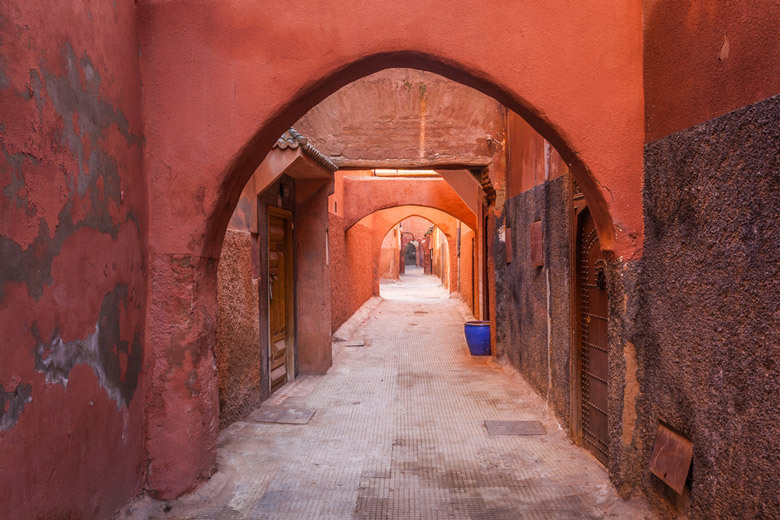 It’s the city’s wealth of culture and historic buildings and neighborhoods that most attracts tourists to visit Marrakesh, and the fact that large parts of the city have barely changed in centuries. Today Marrakesh provides not only a glimpse, but a full blown look into North Africa’s past, and into a way of life that continues for the Berber people right up to the present day. 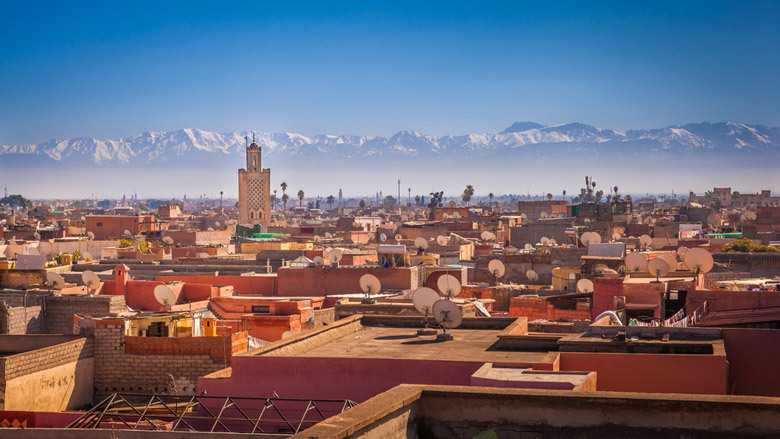 Marrakesh is the fourth largest city in Morocco and it’s the capital of the Marrakesh-Asfi region with a backdrop of the beautiful, snow-capped (during the winter) Atlas Mountains. Its semi-arid climate provides visitors with warm to hot weather all year round, little in the way of rainfall, and ample sunshine. The hottest summer months of July and August are characterized by excessive heat – the average highs during these two months are close to 37C (98F) though actual daytime highs can reach well into the 40’s C. Anyone not acclimatized to such extremes will likely find it too hot to visit Marrakesh during these months, leaving spring and fall as the better options . The Berber farmers that still inhabit the region today have been here since Neolithic times, which is an amazing achievement for a culture to survive so long and in the same region. Marrakesh itself was founded in 1062 by the Almoravids, a Berber imperial dynasty who made the city their capital and set about constructing many mosques and madrasas, helping to boost the rapid growth of the city. Palaces, built and designed by Andalusian craftsmen, sprung up and the now trademark Umayyad style of architecture that the city is so famous for was born. In the 1100s the city was fortified and an underground water system was developed but the fortifications did not stop the Almohads from attacking the city, killing thousands and largely destroying what had already been built. But the Almohads rebuilt their own palaces and mosques and the city thrived once again. Centuries of changing hands ended in Marrakesh being under French control in the early 20th century until the city’s independence was granted in 1956. Since then the city has become a major tourist destination, including as a mecca for hippies, rock stars, artists and actors in the 1960s and 1970s, leading to even more interest in this amazing city. Today you should visit Marrakesh’s World Heritage Sites including its mind-blowing Medina as well as its souks, palaces, gardens, city walls, mosques, tombs and museums for a truly rewarding cultural vacation in this timeless Moroccan city. Steeped in history and culture, Marrakesh is a truly memorable city and a former Berber imperial capital that has something to see at every turn. Get lost in the maze-like medina, search for the hardest to find items in its souks, stroll through its palaces and gardens, and marvel at the beautiful architecture of its mosques. Take a look at our top 10 things to do in Marrakesh to discover the best places for your visit.